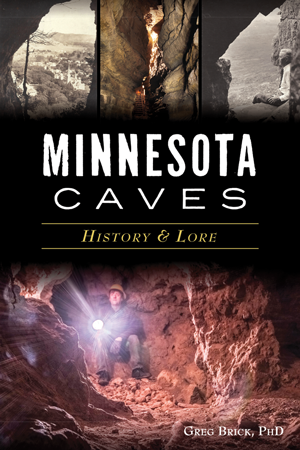 Minnesota's caves have a deep history. Carver's Cave is the first to be described in the literature of North America after explorer Jonathan Carver visited it in 1766. The storied Fountain Cave was the birthplace of the city of St. Paul. Just after the American Civil War, Chute's Cave inspired an elaborate national hoax regarding an ancient civilization. Folklore surrounds Petrified Indian Cave, where a strangely shaped stalagmite was mistaken for a person turned to stone. Geologist and urban explorer Greg Brick, PhD, uses decades of research to uncover the secrets of geological wonders. Greg Brick, PhD, was employed as a hydrogeologist at several environmental consulting firms and has taught geology at local colleges and universities. He has edited the Journal of Spelean History for the past dozen years. He has published more than one hundred articles about caves and was the recipient of the 2005 Cave History Award from the National Speleological Society. His first book, Iowa Underground: A Guide to the State's Subterranean Treasures, was published by Trails Media Group in 2004. His second book, Subterranean Twin Cities, published by the University of Minnesota Press in 2009, won an award from the American Institute of Architects. His work has been featured in National Geographic Adventure magazine as well as on the History Channel. He has led guided tours of caves for the Minnesota Historical Society and the University of Minnesota College of Continuing Education.